In Brignano, it has become a tradition to have a family gathering on December 8th, the feast of the Immaculate Conception, seeking to know and grow in love for our Mother Mary. 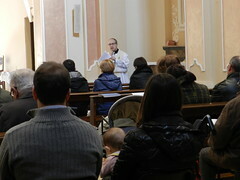 In this our third gathering, that was held at the parish of St. Maria Assunta, about 60 people got together to spend a family day with our Mother. After Mass, and after coffee in the oratory, the adults returned to the church to have a Holy Hour with guided meditation. Meanwhile, the children paid a visit to Jesus in the oratory chapel and to the Christmas workshop. At 12:30 we gathered in the oratory to eat together. The food was prepared with everyone’s contributions. In the afternoon, after lunch, the children had a meeting with the sisters and then they played a game where they got the different characters that would allow them to make a Nativity scene at home: the shepherds, the star, the Magi, donkey and ox, and of course, Jesus, Mary and Joseph. 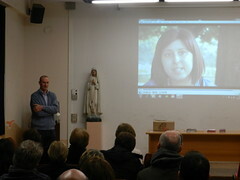 While the children were busy with their activity, the adults were enjoying the testimony of a person who came to talk about Giulia Gabrielli, a 14 year old girl, from Bérgamo, who died three years ago with the reputation of having lived a holy life. Giulia was diagnosed with cancer when she was 12 years old and went through the long and painful chemotherapy treatment in hopes of a cure. It seemed that the treatment was working, but after a year, they discovered some metastases and realized that there was no human solution for her condition. What impressed most of the testimony, was the maturity and the faith of such a young girl who joyfully awaited her encounter with her Lord. The person who came to talk about Giulia had met her nine months before her death and had gotten very close to her during that time. Everyone was really impressed with the testimony of the life and the faith of this young girl, who was able to accept and cope with her situation with such an admirable human and spiritual fortitude. The day ended with all of us praying the Rosary together, in honor of the Blessed Virgin Mary on her Feast Day, and to entrust every family to her protection and maternal care.